The performance management chart is one of the key elements within PerfectPace that can improve your training analysis in many ways. The chart will tell you about your current training condition, fitness, fatigue and it can warn you in case you get into over training. It is not limited to a single sport but allows you to analyze the influence of different types of sport which cause different strain on your body. But let’s have a look at the different elements of the chart in detail. The acute training load represents the direct stress on your body caused by training. It is coupled to the training stress score. The higher the training intensity, the higher your ATL. The load responding quickly to changes. It is moving relatively quickly in both directions. After a single hard session most of the time you’ll be ready to go again the next day. The chronic training load represents your fitness. Just like your ATL it will rise when you train and it will drop on recovery days. It happens however a lot slower compared to the acute training load. The higher your chronic training load get the harder it will be to improve your fitness. The body gets used to training stress and needs harder intensities to adapt and get fitter. 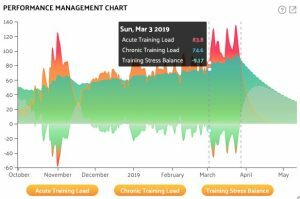 The training stress balance or fatigue is the difference of chronic training load and acute training load. If your CTL or fitness is high you will be able to tolerate high levels of training stress and the training stress balance drops less. You should pay attention to this value while you are training as it can tell you if you are getting close to over training. When the TSB value drops below -40 you should probably consider to reduce your training and start a recovery week. When a competition is coming around you need to make sure to be rested. On the day of the competition your TSB value should be positive so make sure to plan your tapering accordingly. During the tapering your CTL will also drop but don’t worry. Your performance will not be affected because you can compensate the reduced CTL with an improved TSB.